HUMAN SERVICES rentonwa.gov | 27 Tax Preparation and Assistance This tax season don't forget to check and see if you are eligible for the earned income credit, and get free tax assistance in Renton until April 15th by checking United Way of King County at www.uwkc.org/need-help/tax-help or call 206-461-5005. Utility Assistance The City of Renton offers reduced rates for water, waste, surface water and gar- bage for low income seniors (age 61 and up), and low income disabled. The yearly income limits is $35,000. Did you know Renton renters and homeowners in single family residences can get a utility rebate? You qualify if you do not receive a bill from the City but reside in the City limits, pay any utility bill, and are age 61 or older or disabled (with proof of disability), and have a gross income less than $35,000 per household (add $5000 for each qualifying resident). The application deadline for the rebate is June 15th. 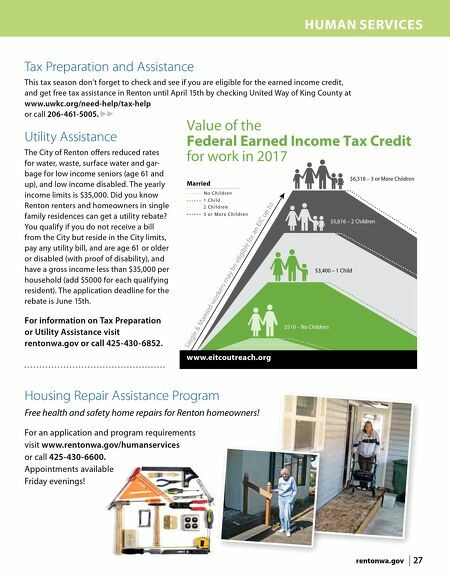 For information on Tax Preparation or Utility Assistance visit rentonwa.gov or call 425-430-6852. Single & Married workers may be eligible for an EIC up to: N o C h i l d r e n 1 C h i l d 2 C h i l d r e n 3 o r M o r e C h i l d r e n Married www.eitcoutreach.org $6,318 – 3 or More Children $5,616 – 2 Children $3,400 – 1 Child $510 – No Children Value of the Federal Earned Income Tax Credit for work in 2017 Housing Repair Assistance Program Free health and safety home repairs for Renton homeowners! 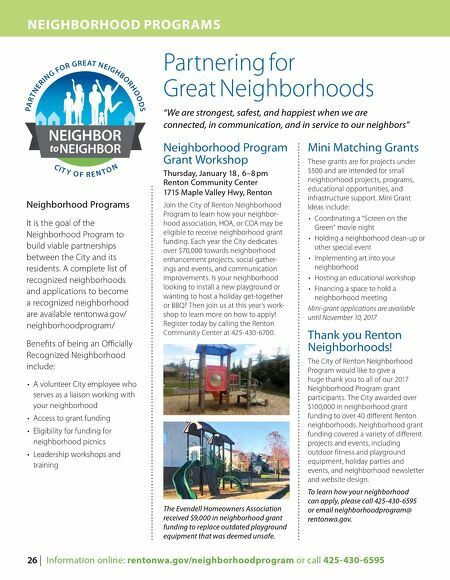 For an application and program requirements visit www.rentonwa.gov/humanservices or call 425-430-6600. Appointments available Friday evenings!